Hāna aerial file photo by Wendy Osher. Maui residents concerned about the discovery of little fire ants in Nāhiku are invited to attend a meeting on Wednesday, Dec. 10th at 5 p.m. at Helene Hall in Hāna. 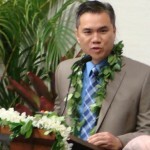 The meeting will include representatives from the Hawaiʻi Department of Agriculture, Hawaiʻi Ant Lab, Maui Invasive Species Committee and the County of Maui. 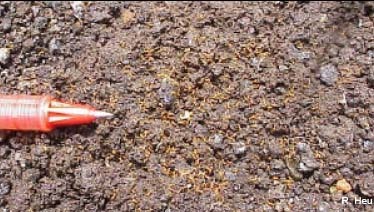 Photo of fire ant colony courtesy R. Heu and the Hawaiʻi State Department of Agriculture. The Nāhiku infestation was discovered on Sept. 18 on 20 acres of land along the Hāna Highway in East Maui. The discovery was made while crews, who were working to eradicate the invasive miconia plant in the area, were stung by the ants. The little fire ant is a native of south America and is considered amont he world’s worst invasive species because of their painful stings that can cause large welts and blindness in pets. Image courtesy W. Nagamine & the Hawaiʻi State Department of Agriculture. LFA has been found on Hawaiʻi Island since 1999. 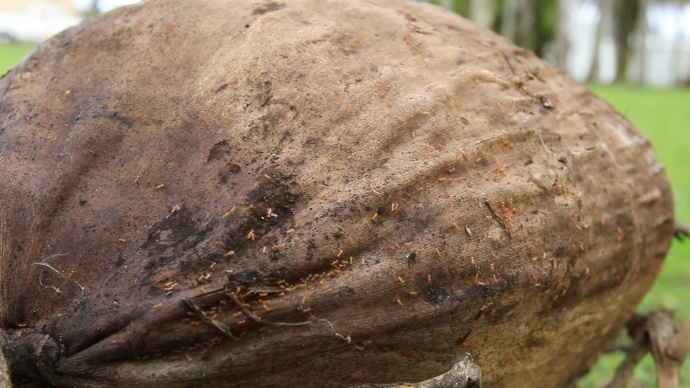 By the time it was identified, the ant population was deemed too widespread for eradication efforts. October 2009 – LFA was detected on a farm in Waiheʻe, Maui. The infested area involved about 1/2 acre and eradication efforts appear to have been successful and monitoring continues. December 2013 – LFA was detected on hapuu logs (Hawaiian fern) at retail stores on Maui and Oʻahu. Since its detection, Oʻahu and Maui nurseries have been surveyed. 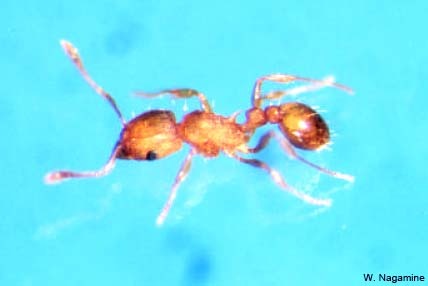 Seven Oahu nurseries, three of which were in Waimanalo, were found to have small infestations of LFA, the areas were treated and are clear of the ants. May 2014 – crews began treating a 6-acre area in Waimanalo, which included a 3.5 acre infestation area and buffer zone. Crews continue to conduct follow-up treatments at the Waimanalo site. June 2014 – a six-acre residential area in Mililani was found to be infested with LFA and treatment of that area is also on-going. July 2014 – A routine survey for LFA by members of the MISC detected a small infestation at a hotel in Wailea, Maui. MISC reported it found one LFA ant at a neighboring hotel. The landscaped areas are continuing to be treated and monitored. July 2014 – Maui HDOA inspectors found LFA on some of 51 hāpuʻu logs from Keaʻau, Hawaii Island. Although the logs were bait-tested for LFA in Hilo and after it reached Maui, LFA was not detected in the bait traps. 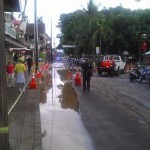 However, upon closer visual inspection, Maui inspectors saw what looked like LFA, which was confirmed by entomologists. The logs were frozen to kill any LFA. Inspectors trace forward two other shipments from the source. They tested 100 logs and found LFA on seven logs. 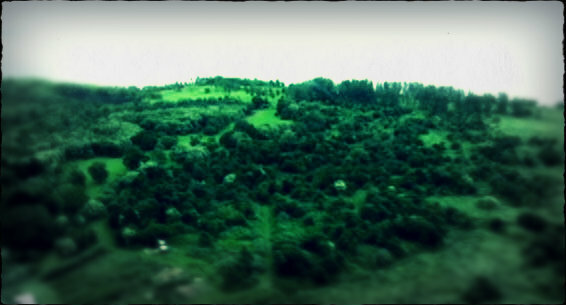 The area was also surveyed and no LFA was detected. Enhanced inspections at both departing and receiving ports have been established. August 2014 – Maui HDOA inspectors doing enhanced inspections found LFA on specialty pineapple transported from Hawaiʻi Island. The LFA were difficult to detect in the crown of the pineapple. HDOA inspectors continue to closely monitor similar shipments interisland. Suspected invasive species should be reported to the state’s toll-free pest hotline at (808) 643-PEST (7378).